Trails start directly from the backyard of the Deublerheim. 30km of trails (classic and skating) for all levels, from beginner to experienced, are prepared in wintertime on the hilly Werfenweng plateau. There are 13km of skating tracks. Many charming huts and restaurants can be found along the trails. 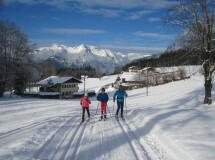 Ski lessons are also available in Werfenweng.